As the Chief People Officer at Blue Cross NC, a lot of my job involves talking to employees, really listening to what struggles they are having, and working with my team to create innovative solutions to how we, as a company, can help our employees live their best lives. A lot of the people I talk to are parents, at all stages of the parenting cycle. I love hearing the stories from the proud father whose daughter is a recipient of our college scholarship program. Or having the chance to offer encouragement to the mother, fresh back from parental leave, near tears and trying to figure out the whole sleeping through the night thing. I laugh with them as they describe tales of mischievous toddlers and preschoolers. When I talk to these parents, particularly the ones in the trenches with young kids, I remember my own days as a working parent. Returning from a 6-week partially paid “disability leave” was the norm for me and many of my colleagues. Our kids are now grown, but back then we juggled balancing it all – rushing from meetings to get to an afternoon track meet; or checking emails while waiting outside dance classes. All the sick days, teacher conferences, soccer games, dance recitals and of course the birthday parties. I’ll admit I sometimes miss much of that now, but for parents of young children, it continues to be real. So, in my work, we talk to parents, and we listen to understand their needs. And we put policies and programs in place that support them. For more than a year now, we’ve provided 12 weeks of paid parental leave, for people like Samantha Kelly, a new mom on our HR team. We have lactation rooms in all of our buildings, for mothers who wish to continue nursing. We have a 5-star backup childcare facility, and flexible work options. These are the type of benefits that the North Carolina Early Childhood Foundation, which runs Family Forward NC, an initiative advocating for workplace policies that positively impact young children and their families, is trying to get more North Carolina employers on board with. 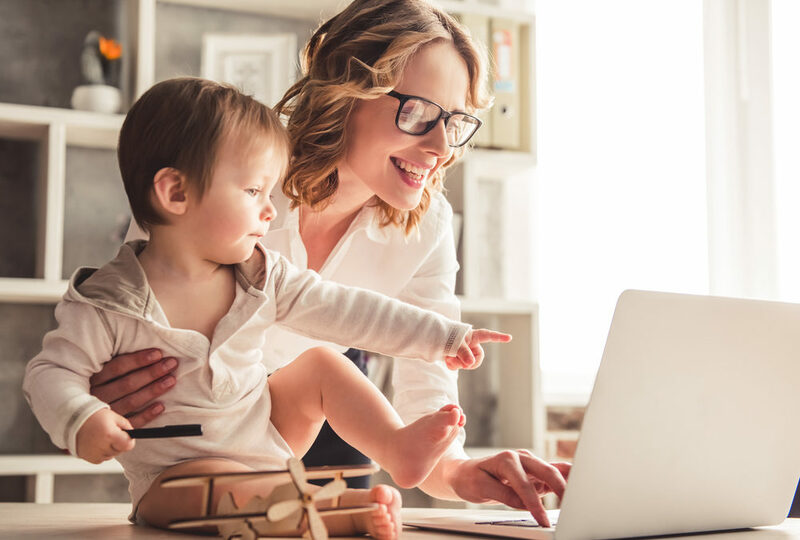 Their recent Guide to Family Forward Workplaces details the current situation for North Carolina’s working parents. According to their research, and our own, children whose parents have access to family-friendly benefits receive much-needed support and time with their parents during the most critical years of human development. This leads to scientifically-proven, positive health outcomes for the kids, like higher educational achievement and future career success, and better health outcomes. And parents who have access to family-friendly benefits also have improved health (including less stress!) and are happier and more productive at work. Wins all around. Take, for example, Chelsea and Charlie Witherspoon. Chelsea works in our Corporate Pharmacy department, and Charlie is a team lead in our Winston-Salem mail room. They were college sweethearts, now married with two little girls. They had their first child two and a half years ago, before we implemented our updated parental leave policy. Charlie had his two paid weeks off (our former “paternity leave” policy), and Chelsea – who was not a Blue Cross NC employee at the time – had six weeks unpaid leave. Numerous studies show how when the father is involved from the beginning, that the “emotional work” that usually falls to the mother is much more evenly distributed. Which makes for a less stressed mom. Family Forward NC launched their Guide to Family Forward Workplaces on April 1, at a gathering of business and community leaders from across the state. I was there, as a Family Forward Advisory Council member, as well as our CEO, Dr. Patrick Conway (dad of four!). At the event, Patrick announced a $250,000 investment from Blue Cross NC, to continue our support of Family Forward NC’s second year. While we are proud to support Family Forward NC, and to offer family-friendly benefits to our own employees, we can always do more – and I am always looking for ways to offer even more support. To my fellow Human Resources executives, and to business owners in North Carolina, large and small – I challenge you also to do more. You may be a small business owner, thinking, I surely can’t offer 12 weeks of paid leave. And perhaps not. But what can you do, that’s more than what you’re offering today? Is it offering a small, private room so that your employee doesn’t have to pump breast milk in a bathroom stall? Is it adding two more weeks onto your parental leave? Or allowing an employee to work part-time hours? Or having a more predictable schedule if needed? Be bold. The return on this investment – this human investment – is numerous, in terms of loyalty, productivity, and commitment to your employees. For children and families, the benefits of family-friendly workplaces can last a lifetime. Take it from me – you can’t ever get back those early years of a child’s life. Let’s all do what we can to set kids and parents up for success. Our future generation depends on it.